To reduce the power generation cost of photovoltaic systems, it is essential to improve the efficiency and to reduce the production cost of photovoltaic modules. At the Advanced Processing Team, we develop and investigate the fabrication process of silicon(Si)-based materials and devices, aiming for realizing high-efficiency and low-cost solar cells. 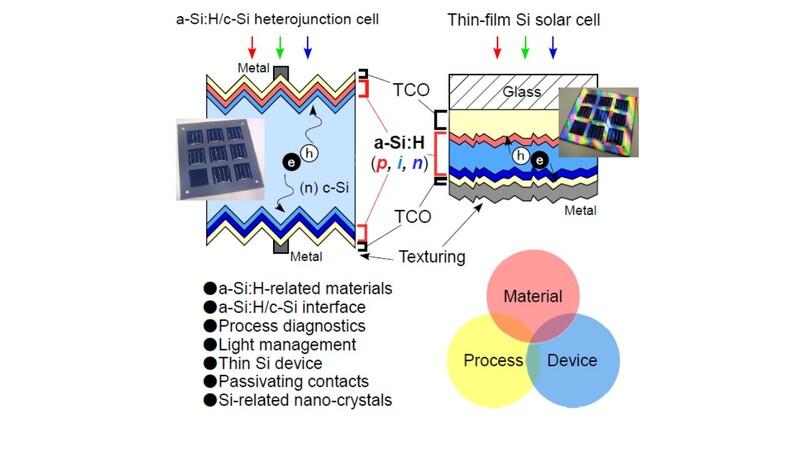 Si-based solar cells can be classified into two groups: crystalline Si (c-Si) and thin-film Si (TF-Si) technologies. In both types of solar cells, hydrogenated amorphous Si (a-Si:H) and its alloy materials are extensively used as a junction/surface passivation layer as well as a light-absorbing layer. Aiming at high-efficiency a-Si:H/c-Si heterojunction (SHJ) and TF-Si solar cells, we are conducting a wide spectrum of research including the process development for high-quality Si-based materials and their interfaces, novel materials for Si-based solar cells, advanced light management techniques, and process diagnostics. Furthermore, the developments of next-generation Si materials are being implemented towards significant cost reduction and higher efficiency. We are conducting the research and development on surface passivation, hetero-junction formation, and light management to realize high-efficiency and cost-effective SHJ solar cells, taking advantage of our wide range of knowledge on TF-Si materials. Thin c-Si solar cells are attracting attention because the thickness of c-Si wafer is expected to be reduced for cutting the material cost in the coming years. We investigate the impact of wafer thickness on the photovoltaic performance of SHJ cells experimentally. For example, we developed a very thin, 70-micron-thick SHJ cell with a conversion efficiency comparable to that using a standard wafer (190 micron). Plasma diagnostics is another research topic in our team. We diagnose gas-phase plasmas, using standard diagnostic tools such as Langmuir probe, optical emission spectroscopy (OES), quadrupole mass spectrometry (q-mass), and laser absorption spectroscopy. 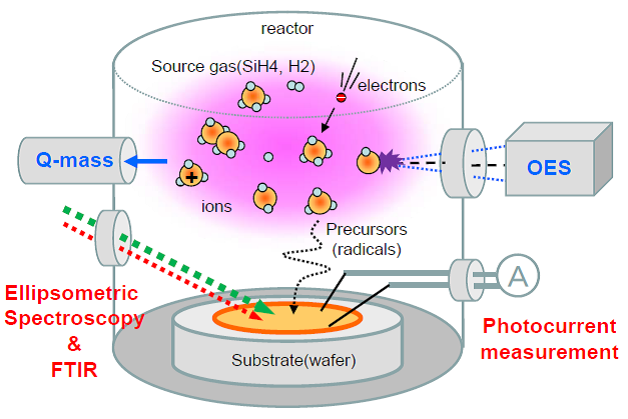 In addition, we perform characterization of opto-electronic properties of semiconductor films under plasma processing, using in-situ real-time spectroscopic ellipsometry and pump-probe technique. This unique pump-probe technique is newly developed in our team, and it enable us to study the carrier transport and trapping under plasma process. According to the results on plasma and material characterization, we develop more sophisticated processes, which yield high-performance solar cell devices. We also focus on novel contact/passivation materials for SHJ solar cells using atomic layer deposition (ALD) method. For example, we have found that ALD-grown titanium oxide (TiOX), which is widely known to behave as an electron selective contact, can work oppositely as a hole selective contact. In addition, we developed hydrogen-doped silicon oxide (SiOX:H) using ALD as a passivation layer for c-Si solar cells. The evolution of the microstructure in SiOX:H during thermal annealing and its correlation with the surface passivation capability are being investigated in detail. Such insights may open new opportunities to realize high-efficiency SHJ cells with new architectures. TF-Si photovoltaic devices are focused not only for power generation in the outdoors but also for powering IoT devices. We have developed several original technologies including triode plasma-enhanced chemical vapor deposition (PECVD) for achieving high-quality a-Si:H films and honeycomb textures for better light trapping, leading to several world record efficiencies in a-Si:H, microcrystalline Si, and multi-junction devices (for example, a record stabilized efficiency of 14.0% was realized in a triple-junction device, as of March 2018). As a next-generation technology, we investigate the liquid-phase crystallization process using a high-density and line-shaped laser scanning system to realize efficient ultra-thin c-Si solar cell. Processing technology of Si nanocrystals and the potential of Si nanocrystals for solar cell application are investigated. Figure.1 Outline of research areas and subjects in Advanced Processing Team. Figure.2 Schematic illustration of real-time diagnostic toolsequipped in a PECVD system for developing high-quality and low-damage film deposition processes. 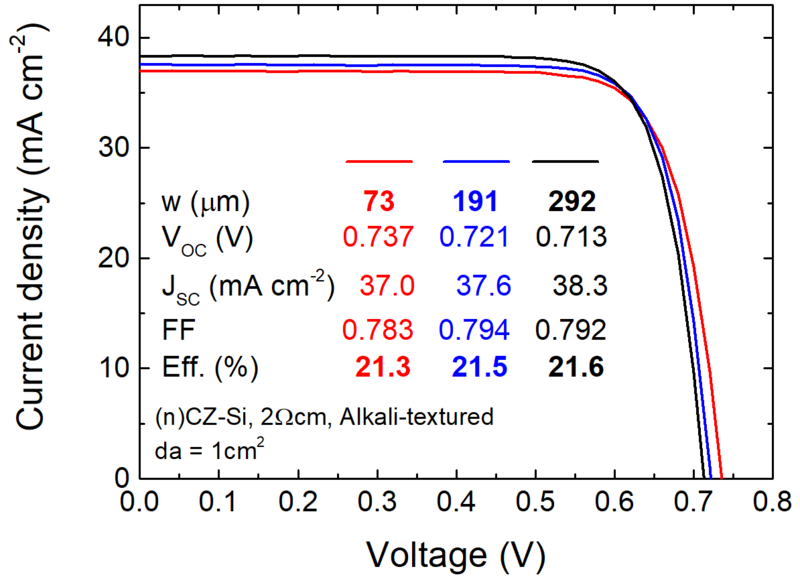 Figure.3　Left: Current density vs. voltage curves of a-Si:H/c-Si heterojunction solar cells using very thin (73 micron), normal (191 micron), and thick (292 micron) wafers. These wafers were supplied by Komatsu NTC Ltd. 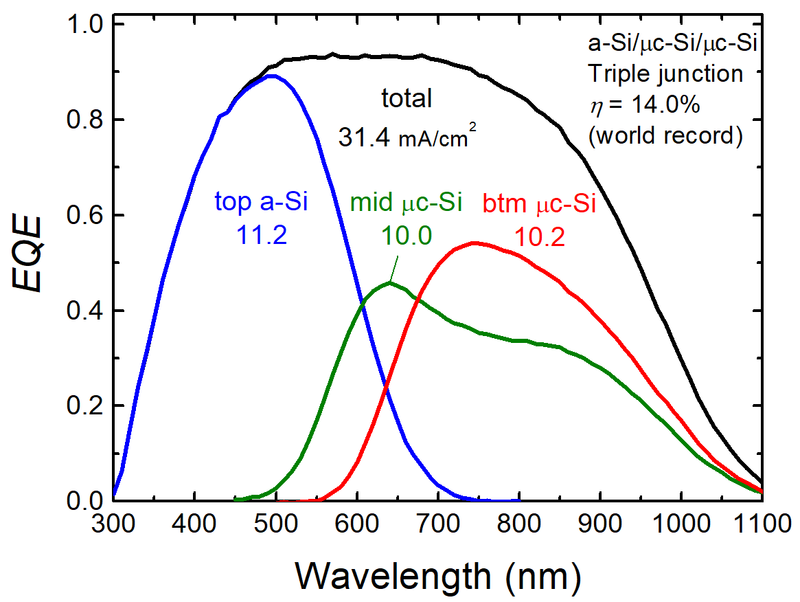 Right: External quantum efficiency spectra of the world-record triple-junction thin-film Si solar cells.